After a grueling five-year education in bike racing (A Dog in a Hat), Joe Parkin describes his return to the U.S., his struggles with the nascent American bike racing scene, and the birth of mountain bike racing. Parkin's new book Come and Gone is the sequel to his widely praised memoir A Dog in a Hat. 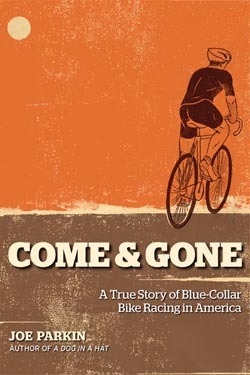 Come and Gone is now available in bookstores, bike shops, and online. After five years of racing in Belgium, Joe Parkin said goodbye to Flanders knowing he might never go back. He never did. Parkin flew back to the U.S. with empty pockets and no contract. For several years, he was unable to watch a Belgian spring classic without tears in his eyes, and seeing his former teammates race the 1992 Tour de France was torture. Eventually, Joe landed a spot with the Coors Light cycling team. After the years in Europe, though, racing in the U.S. was too strange a transition. That's when Joe started racing mountain bikes. Come and Gone follows Joe through three hardscrabble seasons chasing wins on the U.S. road racing circuit before he changes course and tastes victory as a mountain bike pro. A gritty, authentic, and heartfelt personal memoir, Come and Gone is also a chronicle of the rebirth of professional bike racing in America. Joe Parkin's life has not been without adventure. He has been a professional cyclist, stunt pilot, motorcycle racer, and sharpshooter. He represented the United States at the World Cycling Championships and the World Cyclocross Championships. Parkin is the editor of BIKE magazine, blogs at 6YearsInARainCape.com, and contributed to Versus.com.